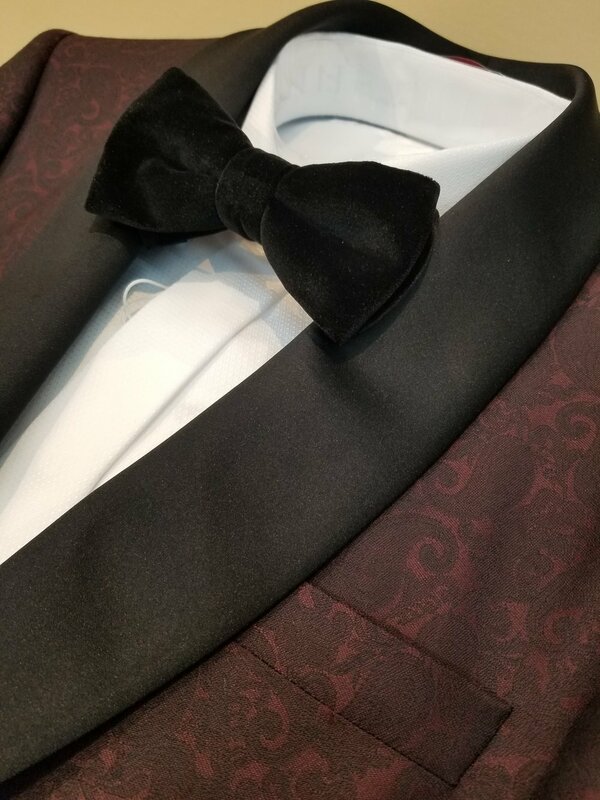 Suits may be our specialty, but we here at UWM Men’s Shop also carry a broad selection of evening wear, navy tuxedos, dinner jackets, cufflinks, tuxedo shirts and accessories. Suits are signature and essential pieces of dress clothing. Meant for any number of occasions, a suit (or a few!) is a good go-to option to have in your closet; they can easily be dressed up or down. However, there are instances where more formal attire is preferred - this is where tuxedos come into play. A tuxedo is a more formal type of suit with a few differences, the main being the introduction of another contrasting material: satin. Traditionally, tuxedos typically include satin accents on the lapels and satin stripes down the sides of the trousers. The buttons are also covered in satin, unlike an uncovered button on a normal suit. The lapels (the collar of the tuxedo) come in three styles: a notch lapel, a peak lapel, or a shawl lapel. The notch and peak lapels have breaks in them very much like a standard suit lapel. The shawl lapel is different and is a smooth, single, unbroken piece of fabric. They are typically worn with a bow tie and a tuxedo shirt (sometimes pleated) with cufflinks. Tuxedos are best worn in more formal occasions. Some of these occasions include an opera, a ballet, a symphony, a formal dance or ball, exceptionally formal restaurants (as some establishments recommend you dress at least as formal as the waiter), or a formal reception. The “tux” may be for more formal events, but there is plenty of reason to buy instead of rent. Renting tuxedos results in an incorrect fit and an uncomfortable night. A comfortable fit results in a confident fit; a fit that renting does not achieve. And when you feel good in your clothes, you look good in them also. If you have any questions, please feel free to email us: taylor@utahwoolenmills.com and we will be happy to answer any formal questions you might have. Also, we carry Tuxedos from $995 - $3795.